Two beautiful architectural applications of copper sheet metal were featured on national home improvement television this past fall. The wildly popular ABC series, Extreme Makeover: Home Edition, and long-running Hometime, which airs on PBS, both specified copper exteriors for their remodeling and construction projects. Some 17 million viewers tuned in to watch the crew of Extreme Makeover: Home Edition build a standing-seam copper roof on a new home constructed for Paul and Cindy Teas, the founders and operators of Camp Barnabas - a Missouri summer camp for children with special needs. 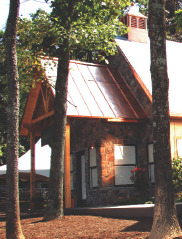 The Copper Development Association donated 6,000 square feet of copper sheet metal for the "Camp Barnabas" episode of Extreme Makeover: Home Edition that originally aired in October 2005. The project involved the rebuilding of a home for Paul and Cindy Teas, the founders of a Missouri summer camp for children with special needs. The Teas' new home was outfitted with a standing seam copper roof, gutters, flashing and a custom-made cupola. "This house has some fantastic copper treatments on it," said ABC's Extreme Makeover: Home Edition cast member and designer Tanya McQueen, during the special two-hour prime time broadcast in October. Altogether, CDA contributed 6,000 square feet of copper sheet to the Extreme Makeover project. In addition to the roof, copper was used for exterior flashing, fascia, gutters, trim and a custom-made cupola. Copper plumbing and wiring were also used throughout the new construction project, which included a remodeled bunkhouse for camp counselors and a new building that houses state-of-the-art media equipment for campers to enjoy. "When we heard of this very worthwhile project, we responded with a 'ton' of copper," said Ken Geremia, communications manager for CDA. "Actually, it was three tons of copper in all. We hope the Teas will enjoy their new home and the campers will benefit from the quality of the copper products provided." The copper sheet was fabricated and installed by Cowin Custom Sheetmetal of Bella Vista, Ark. Daniel Cowin, president, said the standing seam roof they installed will keep the Teas' new home looking good for many years to come. A labor of love, Camp Barnabas was started 10 years ago by the Teas, who purchased the 60-year-old camp using their retirement funds and savings. Named after St. Barnabas, the patron saint of encouragement, more than 1,000 children attend Camp Barnabas each year to enjoy traditional camp activities like horseback riding, canoeing, hiking, swimming, rock climbing and more. Another home improvement television show, Hometime, also put the spotlight on copper in a recent episode. This long-running PBS series, which regularly showcases copper products, documented the installation of a copper-clad entry on a recent remodel of a 1950s ranch-style house in the Lakes Region of Minneapolis. 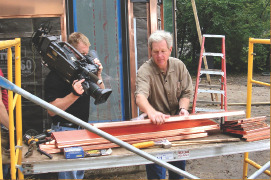 Dean Johnson, host of the popular PBS-TV show Hometime, works on a unique copper-clad entry during a remodel of a 1950s ranch style house in Minneapolis using copper sheet metal donated by the Copper Development Association. "The entryway is so unique," said homeowner Nick Smaby, "that passing motorists are not only slowing down to look at it but also stopping to complement me on it." "There's nothing like copper to put on a house," said installer Dan Hildebrand. Show host Dean Johnson added, "The copper will age gracefully, developing a dark brown, then bluegreen, patina that protects the metal from corrosion. Its durability is legendary - there are original copper roofs in Europe and America that are more than 200 years old."